As some of you already know, Bsurfaces is the new name for Surface Sketching. 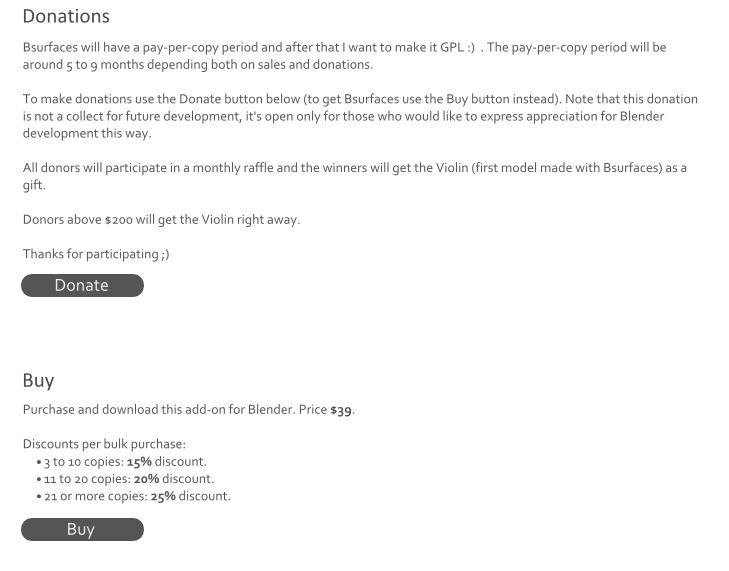 The actual version of this add-on already included in Blender is “Bsurfaces GPL Edition v0.9”. As a way to sponsor its development I decided to make another version that will have a pay-per-copy period and after that period I want to make it GPL for everyone, replacing the actual “Bsurfaces GPL Edition”. So if anyone can’t get it now, at some point it will be available for everyone. Build surfaces, extrude and bridge selections using freehand strokes. Edit strokes as bezier splines. Keep the strokes after building the surface to modify and/or reuse them. Interactively modify in real-time all the settings available. Faster algorithms for surface building to make it work real-time and be controled interactively. Use bezier curves as input. Transitions between closed and open shapes. Make surfaces cyclic, both along and/or across the strokes. Loops on strokes for simple surfaces, extrusions, bridges, surfaces from two connected selections, and closed shapes. Optional automatic join of the crosshatched surfaces to the original mesh. Restrict the automatic joinning of the crosshatched surfaces to the selected vertices. Stretch slider to control interactively how much the borders of the crosshatched surfaces can stretch to get joined to the original mesh. Control interactively the merge distance of the borders of sketched closed shapes and transitions from closed to open shapes. Designate the first point of a spline, both for open or closed splines. No need to make all strokes in the right direction on the first try, they can be changed at any time. Reorder strokes/splines using freehand strokes. Improved interpolation of loops in bridges where the proportions of the edges of the first selection are different from the proportions of the target selection. Improvements on detection of surfaces “along strokes” or “across strokes”. Less precision needed from user, and detects well in more situations. Context detection, and alerts when the context is incorrect. For instance wrong types of selections, or there is only one stroke and no selection, etc. When tweaking options interactively there are available only the options that make sense depending on the context. For instance is not possible to make cyclic the extrusion of an open shape, this is automatically interpreted and the cyclic options are disabled. Automatically filling faces where there are only edges structures. Building surfaces from loose edges, which can be attached automatically to the original mesh. The actual version of Bsurfaces has been tested in Blender 2.58, 2.59, 2.60, 2.61 and 2.62 (official releases from blender.org). If there are Blender Python API modifications, and they remain as they have been in the last Blender releases (quite accessible to overcome), which seems to be the case, there will be updates to make Bsurfaces compatible with the last official Blender release. Those updates will be sent automatically, at no cost, to those who got Bsurfaces. Search it in the list of add-ons and click on the checkbox at its right to activate it. There’s a PDF included with the add-on. It’s a quick guide to help get a grasp of the different features quickly. And in case you don’t find the answer there, can send me an e-mail. Check the contact info at Bsurfaces website. The pay-per-copy period will be around 5 to 9 months depending on how well it sales. Not more than that. Had setup a simple website with some info, for people who would like to get it or in case anyone would like to make a donation (will take those into account too to determine the final length of this first period). Besides the Violin raffle among all donors, if you donate for less than the purchase price but then you donate again and reach the amount of the price with your donations, let me know, I’ll send you a copy for free. First of all Jonathan Williamson. He was the first to foster the development of this new stage of Bsurfaces (he was willing to pay for everybody), also Andy Davies (from Eat3D), Kernon Dillon (from BlenderNewbies), Class Kuhnen (from everywhere with CG in it) and Oliver Villar (from BlendTuts). Good people who had been really helpful. Also Jonathan Cooke and Travis Morgan, you surely don’t know them. Jonathan is the guy who did the voice-over work. Great work, kind people and quick to deliver. If you want to contact him for voice-over work: jonathan.cooke (at) live.com. There’s lot of talent out there doing great voice-over work for fun or CC music. Would recommend two who did good auditions for voice-over work: Jamaal Ephriam and Leroy Shamshidov. I would like to kindly ask other developers not to reproduce the original ideas in Bsurfaces until the code is released. Please keep in mind that it will be GPL for everyone in a short period, and this project is possible thanks to the sales period. So if we can all make this an everybody wins situation, would really appreciate it, and will be good for everybody. Well… that’s all… and for those who get it: enjoy!.. and for those who can’t right now, you will get it soon! WOW! Some very impressive work here. Looks like a bit of a learning curve, and definitely not for those with a poor sense of space, but the time saved would be enormous! Looks to even replicate some of the features of ZBrush’s Shadowbox when combined with the solidify modifier. I’ll certainly be buying this addon within the next couple of days when I get my hand cast removed and I can start Blending again. Congrats though, this is very impressive stuff. Thanks you for this work!! And nice idea to promote Blender development !! I will donate, and wait for the final release! An extremely interesting business model: pay to get the software now or wait some time. I really hope that it will work. Unfortunately the only way to pay is PayPal (I have read lots of horrible stories about PayPal and I would not touch it with a kilometer long pole :no:). PayPal is perfectly safe and your money is protected against fraud etc. Bad things about paypal? Weird. I use it for everything from transferring money, to personal debts, to rent payments, and I’ve never had a single issue. I’ll be sure to purchase the script ASAP! I imagine such a thing in the official blender sometime in the distant 2.6x series, ported into C. Would totally boost up blenders reputation as a modeling tool. The music in the video got old pretty quick though. This is not just an add-on to Blender. The re topology and sketch tools are pretty cool. Count me in, I’ll be buying this as soon as I return from vacation. suggestions: 1. Break up the video into smaller feature videos. advertising will make this a success. here, blenernation, facebook targeted adds and google targeted ads. Looks amazing, but I think I can wait till it’s free. It costs $39 for 5-9 months and GPL Free after that. Cuesta $ 39 para 5-9 meses y libre GPL después de eso. Paypal is just fine. You don´t need to store money there or anythig. For payment you link your creditcard with an account, best is to also order a OTP dongle and your creditcardnumber is savely stored at their server and you can pay with the dongle that changes the password every 30 seconds. Great stuff, I was actually hoping the new api and plugin system will lead to quality plugins you can buy. I did my part to make it free for all already, I don´t care if I use it now or not. I think the plan alone to make it GPL after development is paid for should be rewarded fast. I wish you plenty of sales and a free version soon. I’d imagine that people who pay now will have some say in what tools are developed, and perhaps a slight amount of say in what direction it goes in. If possible that would be a big incentive to buy now. Then you have the knowledge that you are making something available to the whole community at the same time, which is a nice feeling. Great tool and contribution Eclectiel. Thanks. Btw, I always use paypal and no problem for me as well.